Between our living room and dining room was our "office". 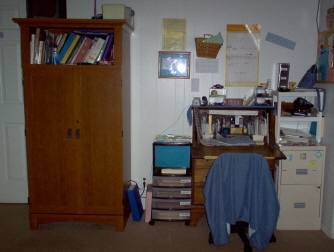 We had an armoire computer desk so we could close the doors to keep little ones out. On the filing cabinet there are toddler magnents. The reason I keep stacking/nesting cups, bean bags, plastic nuts & bolts, firemen guys in here is they are "special-quick toys". These come out about 2 or 3 times a week in those times when we need something to do during a transition or the phone rings, LOL! This is our Sensory Table. 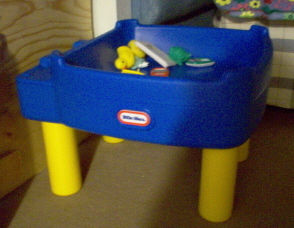 It's the Little Tikes Sand and Water Table, and I took the "water part" off. It works great for a toddler sensory table! In our kitchen I keep several things. To the left of my microwave is a bottle drying rack. The bottles go straight from the dishwasher to the rack, ready for the next feeding. Hanging above the microwave are two clipboards. The first one is the menus and paperwork for the Federal Food Program. This keeps all the paperwork together. The clipboard on the right is our Medicine Record and Accident Log. I record each time I give a child medicine or a child gets hurt while in care. Having these logs hanging here makes it a snap to make a quick note. 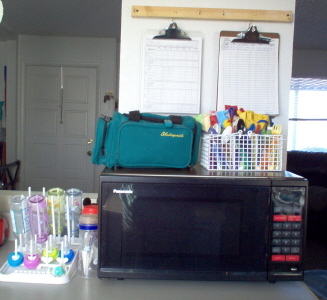 On top of the microwave is our medicine bag (the green bag). It's a Shakespeare tackle bag with a backpack lock to lock the zippers. 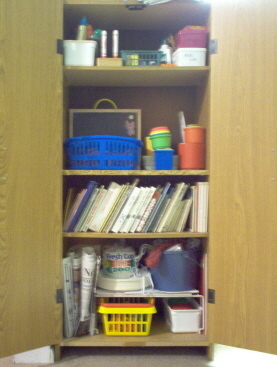 This is where I keep all the Tylenol, teething, and other medcines out of reach of the children. Next to the bag is a silverware basket. I have infant spoons, toddler spoons, and toddler forks in each section. In the napkin holder behind the forks and spoons, I have rolled up the bibs and stood them up.